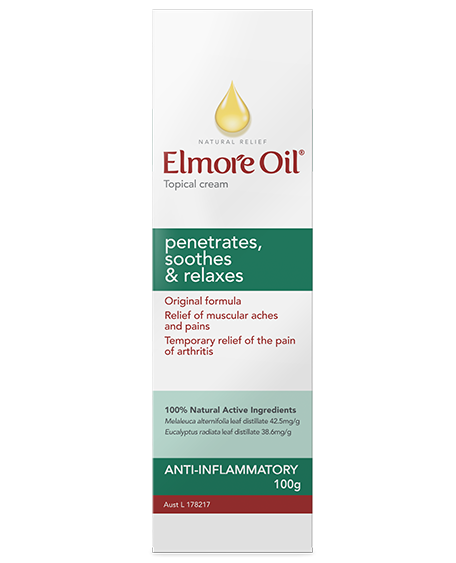 Elmore Oil can provide temporary natural relief of muscular aches and pains, including the symptoms of neck, upper and lower back pain and mild arthritic pain. It is an anti-inflammatory that may assist with increased joint mobility and reduce joint inflammation and swelling. Trusted by Australians for pain relief for over 18 years. 100% Natural Active Ingredients of Elmore Oil. The natural active ingredients include Cineole, distilled from Eucalypt, a complex oil with pain-relieving properties, and Terpinen-4-ol, distilled from Tea Tree, to reduce inflammation. CINEOLE is sourced from Eucalyptus radiata, the Blue Mallee eucalypt, which has the highest concentration of cineole of any eucalypt in the world. 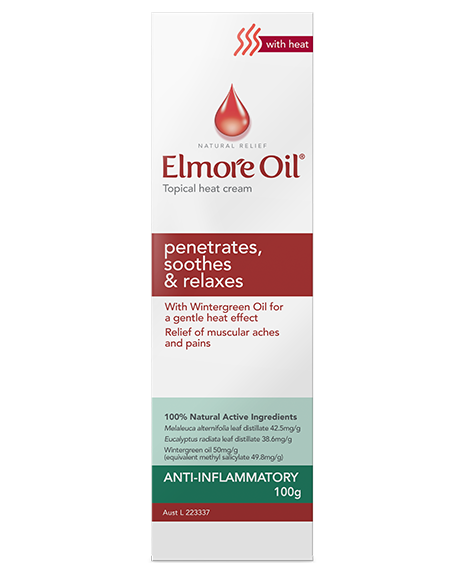 Apply a small amount of Elmore Oil to the affected area and gently massage in until fully absorbed. Use twice daily for 14 days to maximise the anti-inflammatory effect, then as required. Users typically report improvements in pain within a day or so. However relief from the pain of rheumatism can take up to 14 days. Use Elmore Oil as directed every day for at least 14 days and if you find it does not work, simply return the unused portion to the address shown on the pack for a full refund. If symptoms persist, seek the advice of a healthcare professional. For external use only; avoid contact with eyes or mucous membranes. You can now enjoy all the benefits of Elmore Oil in a cream. The same active ingredients as Elmore Oil are blended into a proprietary cream base. It’s easy to use and convenient for travel, as the cream rubs in easily and goes to work straight away. The original Elmore Oil cream and oil with Wintergreen Oil for a gentle heat effect.